As mentioned earlier, the aftermath of the tornado on May 11, 1953 contributed heavily toward the decline of the downtown area. Urban centers in many cities were beginning to fail with the advent of the shopping malls and Waco was among the number. In hopes of revitalizing and changing this decline, the fa�ade of the lower floors of the ALICO Building were altered. This was the first physical change to the original structure. The second out standing physical change was the addition of air conditioning. This tornado aftermath also hastened the need to consider air conditioning the building. Even though the tornado left the ALICO Building virtually unscathed, there were some minor damages. The windows on the ground level in the bank offices were blown away and two skylights on the roof of the building were blown out. These skylights, when opened along with small periphery windows, enabled the hot air in the summer months to escape. The airflow in the building then had a 'chimney effect' in that when the windows were up and the roof skylights were opened...the the hot air would rise to the top and leave the building. The skylights also provided extra light for the very top floor. After the tornado these skylights were sealed and no longer available for hot air to escape. It was during this time in the early summer of 1953, that officials of Amicable Life Insurance Company began developing plans to air condition the building. Definitely the need, desire and challenge were there, but information on comparable success jobs for buildings of this size was hard to find. Once the discussions began, anticipation of cool air overjoyed everyone immensely and time seemed to stand still. Over and over came the question ...'will we ever be able to get cool air?...' Air conditioning a building already 40+ years old, in 1953 and not originally designed for modern living truly became a challenge. This was no small task and it required many man-hours of engineers of several industries such as electrical, structural, sheet metal, plumbing and various air conditioning experts to develop a plan which required four months to design. Some areas of actual production were questionable and eventually time would tell the success story. Once developed, it required seven months to implement. The longest time expended was required for the extension of the floors for a/c units and sheet metal work for air ducts. Ironically, the time to put in the units, test and calibrate required only a few short weeks. 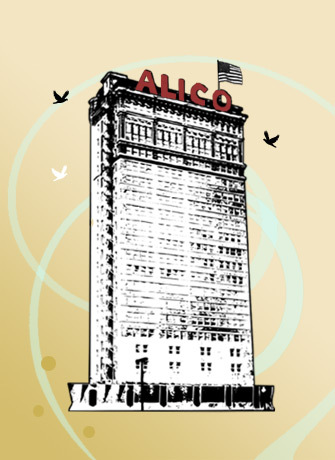 As indicated earlier, the ALICO Building, built in 1910, was wired for electricity. Although the building had its own power generating facility, modern electricity was used for daily activity. Study and testing of the current electrical wattage was performed to insure proper availability to prevent power failure for any future requirements. Additional electrical power was needed for the conversion and this was the time frame wherein the use of the original generator, which provided alternate independent power for so long, and especially as emergency power after the tornado, was discontinued. The structural engineer and contractor developed the plan to take the service elevator shaft in the back of the building (alley side) and build a floor extension of approximately 12 inches thick of cement and rebar to house the a/c units. There would be a 5-ton and a 10-ton each for cooling. These new "floors" or extensions were inserted beginning with the 3rd floor and extending to the 20th floor. The next step was creating the air ducts on each side of the a/c to extend the entire length of the building for air distribution. Soon they were ready for various heavy equipment including a water tower to be placed on the roof. Heavy pulleys were secured and specialists were on hand to assist in this final phase of putting in place the needed equipment and supplies to finish this project. Scores of workers such as plumbers, electricians, and construction contractors were needed to complete the entire job. In September of 1954, air conditioning for the ALICO Building became a welcomed necessity and gone were the days of raising windows for air movement.